Remove spare rib from package and lay on your cutting board with the bone side facing up. Find the longest bone which should be the 3rd or 4th bone from one end. Using your knife start on one end and cut just above that bone going the full length of the ribs so only the meat with rib bones are left and separated from the super thick upper part. Save this thick part and we will explain later. Now this is the hardest part of trimming. You need to remove a very thin but very hard membrane from the back of the ribs. At the end of the ribs holding a paper towel pick at the thin surface till the corner of the membrane starts to come up. Grip a hold securely and pull it the full length of the ribs exposing the meat and bones below it. The reason for removing this is to allow the rub to penetrate the meat. Also, if it is left on when cooked that part of the rib is very hard to bite thru. 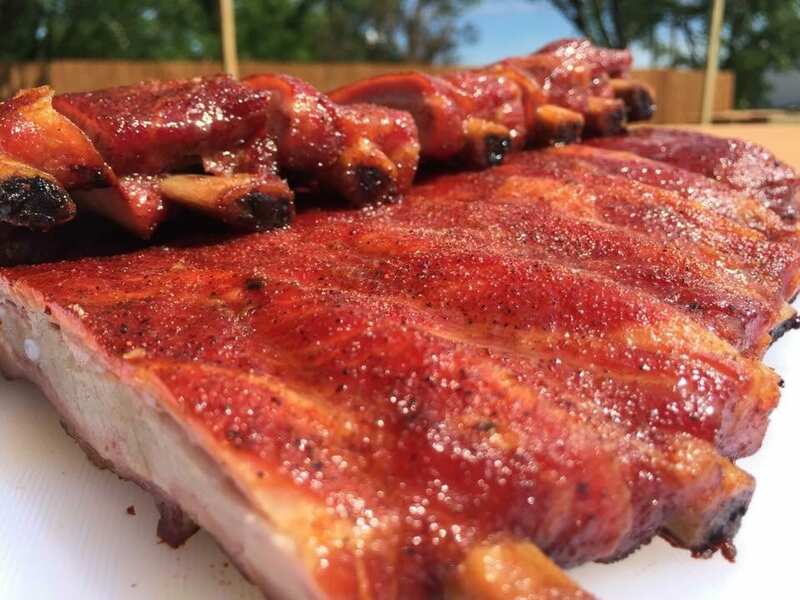 Turn on your grill and set it at 275 degrees while you apply seasoning to the ribs. Start with the bone side up. Apply a medium coat of Butcher BBQ Honey rub. Flip the slab over and repeat. 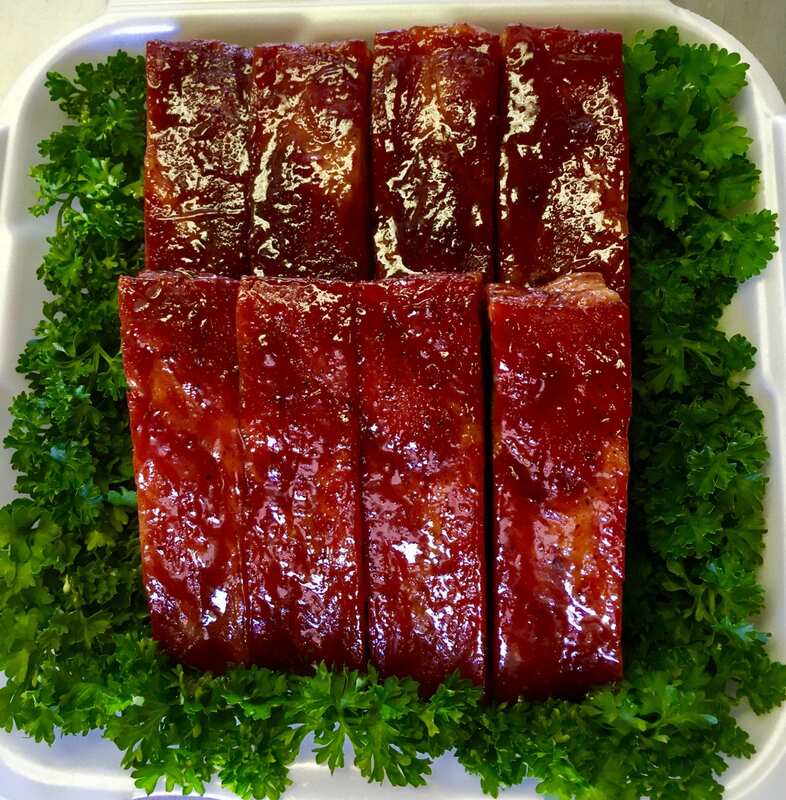 Now is the time to bring back in the thick part of the ribs you trimmed off. Apply the same rub to them. Let set for 1 hour before cooking allowing the flavors of the rub to start to penetrate the rib meat. Once that has passed place the ribs on the grate meat side up. Shut the lid and don’t peek for the next hour. Then just rotate the ribs 180 degrees and apply on the top of the ribs Butcher BBQ grilling oil. Close the lid and wait one more hour. Have 2 pieces of aluminum foil measuring about 6 inches longer than your ribs and 2 pieces of foil measuring about 12 inches long. With the ribs apply a lite coat of the Butcher BBQ Chipotle rub on both sides then place a medium hand full of brown sugar on the foil patting it flat. Squirt 2-3 lines of the Grilling oil over the brown sugar. Lay the ribs meat side down. Roll the edges of the foil up and return to the grill with the meat/brown sugar side resting on the grate. Now let’s take that thick meaty end and cut it into 1-inch long cubes, follow the same wrapping method then return to the cooker. In one hour just rotate the foil packs so the heat of the cooker is hitting the opposite side. In about another hour, you need to check the temp for doneness. My target temp is 204. After getting there remove from the grill but leave wrapped up for the next 15 minutes. Remove from foil, apply BBQ sauce on both sides. Place back on the grill shut the lid and let the rub get sticky. Now have your favorite potato salad and ice tea ready. Clean all silver skin off the exterior of the fillet. Cut the meat into the desired thickness, we feel 1 inch should be the minimum. Put the stockpot on the grill and fill the pot with red wine full enough so the steaks will be covered while the grill temperature is at 250 degrees. When the wine reaches 120 degrees place the steaks in the pot. Keep a close eye on the fillets and when the steaks get to an internal temp of 120 degrees remove the entire pot from the grill and raise the temperature of the grill to 400 degrees. While it’s doing that take each steak and apply Butcher’s Grilling Addiction on the exterior. After it reaches desired temperature place the steaks on the grill and do a quick sear on both sides till internal temp of 138-140 for medium doneness. Use the remaining wine and reduce it down for a reduction sauce. Doing this with the wine that has the steak juices already will help enhance the product when its finished. Use this sauce to drizzle over your steak when sliced to help bring out the flavors and aromatics for dining. Wine recommendations from Master Sommeliers Randa Warren for fillets is Canvas Cabernet Sauvignon. Remove pork loin from package and trim any excess unwanted fat off the surface of the loin. If the loin is too large for servings needed cut it down at this point for the correct serving size needed. Place the loin on your cookie sheet this will help with the next step. Using the Liquid Pork Injection pour some into a bowl, then take your free injector and inject top, bottom, and sides of the loin. Wipe off any excess injection remaining on the surface of the loin. After the loin has been wiped down apply a medium coat of the Butcher BBQ Savory Pecan Rub to the surface. Cover with foil and place in the refrigeration till ready to cook. For best results let the injection and rub set 2-3 hours so it can work its magic to ensure the moistness for your finished product. Have your grill preheated to 250 degrees filled with their Cherry smoking wood. Place the loin directly on the grate surface in the manner you want it to look when cooked (if you want it in a circle this is the time to do this). 1 hour into the grilling time rotate the complete loin 180 degrees to were the smoke will touch the opposite side first (this will only ensure a more even cook). Now drizzle some of the Butcher BBQ Grilling oil over the top. In about 1 more hour repeat this process once again. When the pork loin reaches and internal temperature of 165 degrees remove it from the grill and let the loin rest for minimum of 15 minutes before serving. 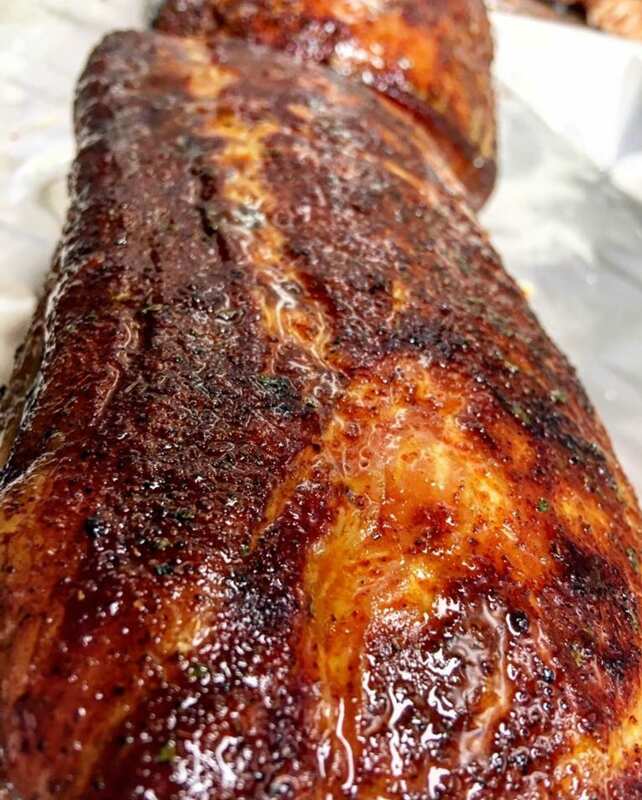 For a final dress on the loin you can apply your favorite glaze, BBQ sauce, or even a lite coat of the rub again. If you do this, initially remove the loin at 160 degrees so when you place it back on the grill and it won’t over cook. This finishing method will allow for the glaze/sauce to caramelize on the meat.